We’re thrilled to bring back to the show this week Mr Joseph Mencel. For those of you that are long time listeners he needs little introduction. Business Owner, Real-Talk Influencer, Professional body-builder and long-time friend of Oz', Joe has plenty to offer and inspire all of us on. “People often tell me that they want to start their own business. When I ask them why they are quick to list off all of the perceived benefits; more time with friends and family, financial freedom, flexibility with working hours, being your own boss... To be honest, I think they have been misled. In the 13 years that I’ve been running MassiveJoes I’ve learned more about business, people and myself than I would have ever imagined. And yeah, there have been some incredible highs. But the truth is, most of the time, it's been tough. It's been incredibly tough. It's consumed every ounce of my mental & emotional energy for over a decade. I’ve worked every single day since day 1. Time off? What time off? I've lost friends - in fact, I now don’t have any friends who aren’t work related. I've given up time with family that I will never get back. The personal financial freedom I’ve experienced pales in comparison to the financial pressures of funding an ever growing empire. I’ve seen far more frequently the worst, rather than the best, in people. I've been let down by those who I've trusted time & time again. I've been so consumed by stress that I’ve literally felt physically sick. I’ve been continuously criticized by people close to me for not having balance, been told my priorities are way out of whack, and that I’m wasting my life. And I've seriously considered throwing the towel in on multiple occasions. But you know why I continue to push forward? It’s certainly not because of those perceived benefits that most people are quick to list when they think of starting their own business. They simply do not exist. It’s because I'm obsessed. I love this. Call me crazy, but I wouldn't have it any other way. If you want to run your own business the primary reason for doing so should be because you are so passionate about what you are doing that it becomes an overwhelming obsession. I’m not saying this to discourage you from starting your own business. I’m saying that the general perception is worlds apart from the reality. The reality is, you have to be obsessed. If you are, go for it. This is why I asked him on the show. We cover everything from failures in life, love and business… to how to recover quickly from failure… to motivation… to goal setting… and we answered a bunch of questions sent to us from you guys & girls via Instagram. I love putting this show together. It has a lot of deep and informative conversation that we can all learn a lot from. 07.22 : 11.32 – Reset Fast. 36.33 : 50.23 – Ahh Yes, Passion. 55.34 : 1.01.44 – starting a business. 1.01.45 : 1.16.07 – The importance of Culture. 1.16.08 : 1.23.58 – Who do you learn from? 1.23.59 : 1.35.57 – Poor Life Impact if Not Present. 1.35.58 : 1.50.12 – Macro & Micro. 1.50.13 : 1.54.53 – Oz’ Takeaways. 1.54.54 : 1.56.11 – Joe’s ambition for his loved ones. 1.56.12 : 1.59.35 – Thank You an Wrap Up. Myles Bush, CEO of PH Dubai. Another conversation between two old friends, the Words With Oz Podcast is thrilled to bring you this intimate, familiar, unfiltered conversation between Myles and Oz. The two discussed what drew them to the beginnings of the Dubai real estate market and particularly, what differentiated Myles from so many others who didn’t make it through the turmoil of the down times; his beliefs on performance and an unfettered desire to be nothing but the best. 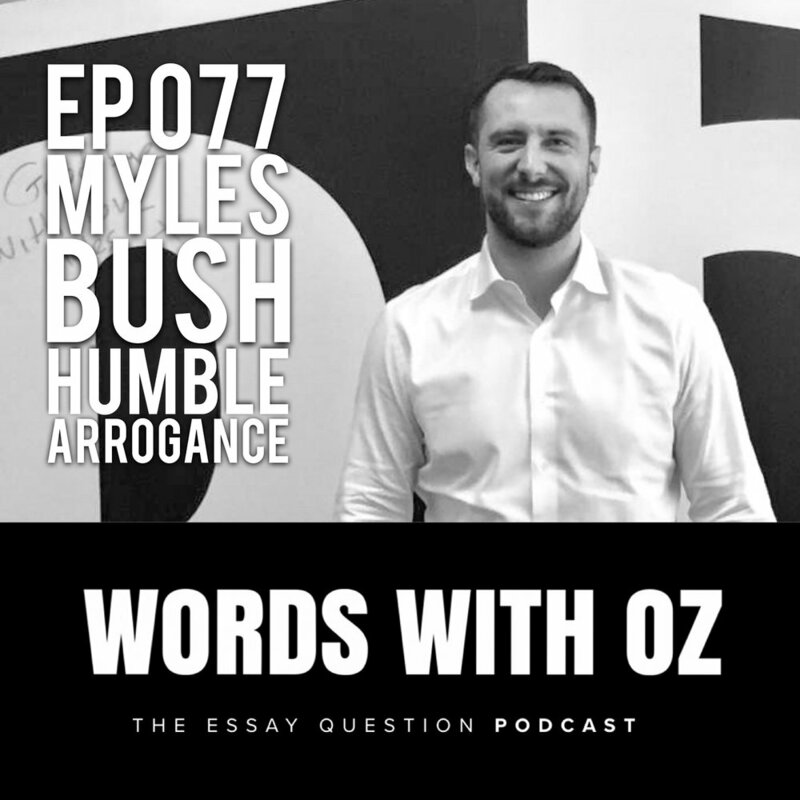 We spoke about the growth and wisdom that comes with age, occasions for competing and occasions for being humble; Myles’ charitable endeavours and many other inspiring thoughts about his success and lessons learned. 1.05.13 : 1.05.51 – Thank You and Wrap Up. This week we are joined on the show by presenter, journalist, entrepreneur and positive influencer Scott Bidmead. Scott’s career has taken many turns and we asked him on the show because of his most recent venture down the path of positive psychology; particularly his perspective of positive business, both in function and form. We dove into discussions of his origins in business; the importance of internship; the value of free-work; as well as the inherent negativity in being positive. 48.21 : 52.02 - what's next? 1.12.15 : 1.13.06 - Thank You and Wrap Up. This week’s guest on the Words With Oz Podcast is the co-founder of performance-wear powerhouse 2XU, Jamie Hunt. Jamie is a former professional triathlete turned businessman with a unique passion for textile and fabric; and a relentless view of hard work. I asked Jamie on the show because of his opinion on what it takes to own the niche of an industry; and the proof he has put in play with the quality and success of 2XU. We spoke on prioritising family in his outrageous schedule, the support it takes to make a dent in business, his fortune as a triathlete and plenty on the challenges we’ll face creating a billion dollar company. 07.58 – The Family of a Frequent traveler. 09.28 - Teaching from practice, not preach. 13.57 – Prioritising in person. 19.03 – The support that it takes. 33.04 – Training is a Must. 35.47 – It’s work ethic, not just talent. 1.12.02 : 1.14.40 – Thank You & Wrap Up. I asked David on the show because of his unique view of the FMCG industry being that he was first to market with his Coconut water brand. He has an adventurous spirit and had always been around business, indeed this was not his first innovative venture, but he has clearly found a calling in this space. We spoke about trusting yourself, the development of his entrepreneurial abilities, changing peoples’ thinking and much more. I AM ME AND I'M OK WITH THAT. Declan Edwards is the co-founder of BU Coaching. A platform of Emotional Wellbeing Education that tackles self-help with a brand new approach. I asked Declan on the show because of his energetic approach and our similar line of thinking. It makes for an incredible conversation that will inspire listeners to begin the changes to live their purpose driven life. "How is it that some stumble across confidence, success, purpose and passion with an air of blissful ignorance; and others can actively seek clarity, can journey deep to their innermost selves, yet still feel questions unanswered?" Declan and I speak on his own growth & changes, the realisations that come with emotional growth and the benefits of giving. 04.02 : 06.44 - Introducing Declan; top down. 31.26 : 38.13 - Stop thinking. Start Doing. 1.20.13 : 1.21.16 - Thank You and Wrap Up. This week the Words With Oz Podcast welcomes entrepreneur, dreamer and provider of positive energy & frequency - Sturt Hinton. Sturt's story is full of personal and external challenge. From leading his industry to the depths of depression; his journey of recovery and discovery of purpose... to creating a product now officially titles the world's best. Sturt is the founder of Frequency H2O and had the vision to impart light and sound intro water... a statement some beg beyond belief - but the results speak for themselves. "Why is that; not until you’ve been stranded outside of what is normal, can you understand the power of the invisible?" We discuss his realisations, what Sturt focused on the remain motivated and the challenges of running a start up. This week the Words With Oz Podcast welcomes one of Australia's most successful entrepreneurs James Spenceley. James is a venture capitalist, philanthropist, innovator and was the founder of telecommunication giant Vocus. His forward thinking and ambitious approach led Vocus to growing a market cap of over $5 billion in the first 10 years. "Is the art of performance in business more reliant on making aggressively laid plans or pursuing them?" We spoke about the necessity to aim for the impossible and the attraction that provides for the best talent. James gives great insight into being vulnerable, listening and collaborating; as well as urges our youth to learn how to learn. Plenty to be learned from this forward thinking mind. 04.31 : 07.55 - Introducing James, location and lessons in foundation. 14.07 : 21.13 - Re-Think how it's done. 1.05.20 : 1.06.21 - Thank You and Wrap Up. This week Oz is joined by the sports chiropractic specialist Luke Khoury. More than just an accomplished practitioner, Luke is an educator, an esteemed businessman and an all round decent bloke. Luke thinks beyond the normal ideals of practicing chiropractic or running a clinic and we asked him on the show to share his mission focused ideals; and how they have shaped the success he is experiencing. "Professional Services and Business Acumen are not often developed concurrently, what has been the universal key to your growth and development? And how important has the strength of your mission been to guide your decisions?" Hear Luke's thoughts on the neurological side of supporting patients, balancing business owner & practitioner, as well as the deep dive into the art of giving and being human. 24.34 : 31.50 - Realising we don't know it all. At all. 51.27 : 54.00 - Help. People. This week the Words With Oz Podcast is delighted to bring to the conversation a beautiful lady with not only the practical experience of what she preaches but also pursued the academic and research path... Chelsea Pottenger knows what she talks about. Chelsea Pottenger is studying her PhD in clinical psychology and neuroscience; and is a lady with her own life altering story to tell. "People often rely on two forces to change their life, inspiration or desperation. Are these the only triggers that will truly make us live the life we love?" We discuss the development of GRIT, consistency vs. intensity and finding the right tribe to tackle our problems with. Chelsea has the demeanour and the story that will connect with everyone. Muse : Measures brainwaves while you meditate. Spire: Tracks your diaphragmatic breathing. Use code EQMINDS to receive $30 off. Oura ring : Very accurate tracking of HR variability and sleep. Use code EQMINDS to receive $50 off. HeadSpace, Oak, Calm, Smiling Minds. 35.27 : 39.53 - Sometimes... it's not you. 39.54 : 46.06 - the GRIT, the company, the process and the people that help you through. 46.07 : 50.45 - A passion for what you do. 50.46 : 56.51 - Daily. Practice. 56.52 : 58.37 - Inspired by my home. 1.04.33 : 1.06.08 - Ambitious Hospital. 1.06.09 : 1.06.53 - Thank You and Wrap Up. We welcome to the show this week Dr James Fielding. James is co-founder of revolutionary headphone company Audeara. Audeara are the creators of the first full-fidelity headphone that tailor their sound to your unique hearing profile, ensuring perfect sound, every time. James has four degrees, is a medical doctor with a passion for changing the way we think about hearing. As you'll experience during the episode, James has an energetic, inquisitive and positive view on the world... which translates into his entrepreneurial wisdom and makes him a perfect guest. "It’s a magical moment when someone is able to marry their passions. Even more spectacular when those passions meet a need in the market. As a spectator, these events can seem nothing but serendipitous; though in reality the journey is often filled with much more struggle. Did it take an active bucking of societal norms to pursue a passion project or was there an ease of flow in your pursuits"
23.31 : 27.35 - I just f*ckin' Love it. 50.42 : 57.53 - Keep. Going. THE EFFECT OF ENDLESS ENCOURAGEMENT. This week the Words With Oz Podcast is proud to bring to the show Miss Rebekah Giles. Rebekah Giles is a member of the Australian Financial Reviews Top 100 Most Influential Women, and her reach spreads far beyond the esteemed law partnership she holds. Charity Board Chair, Board member of sporting entities, Tsunami Survivor; as well as having been subjected to over 140 surgeries, Rebekah is the epitome of resilience and self-belief. Though, as becomes apparent during this conversation, it is the encouragement from others and the unwavering support of loved ones, colleagues and mates that Rebekah credits to be the true source of her abilities. "What is your definition of resilience? And how does one call upon it in their life and career when they have not had the misfortune to need it?" Rebekah provides insights into her thoughts on relationships, failure and culture. Her experiences are real, her reflection raw. This is an incredible episode. 30.17 – Take the risk. 32.44 – The Journey to Law. 36.12 – Like attracts Like. 38.08 – Relationships break. Learn. OUR BELIEF BECOMES THEIR BELIEF. Oz was lovingly welcomed to the lounge room of Chief Brabon and Emilie Brabon-Hames for this week's Words With Oz Podcast. Emilie and Chief have an extensive history in the training, bootcamp and coaching world but have more recently been making headlines for their work transforming some of Australia's most well-known humans. As we are quick to find out, their passion lies in a standard of service delivered to all clients subject to their criteria for wanting, needing and dedicating yourself to train with them. The transformation these two provide is never just physical and it need be something you want, desire and understand. "Long lasting Transformation is an inside-out journey. Is this true? And if so, at what moments do you see that those you work with comprehend the concept?" 31.50 – It’s not easy. Everyone has their own issues. 1.32.56 – The Ambitions of Chief and Emilie. 1.33.31 : 1.34.12 – Thank You & Wrap Up. 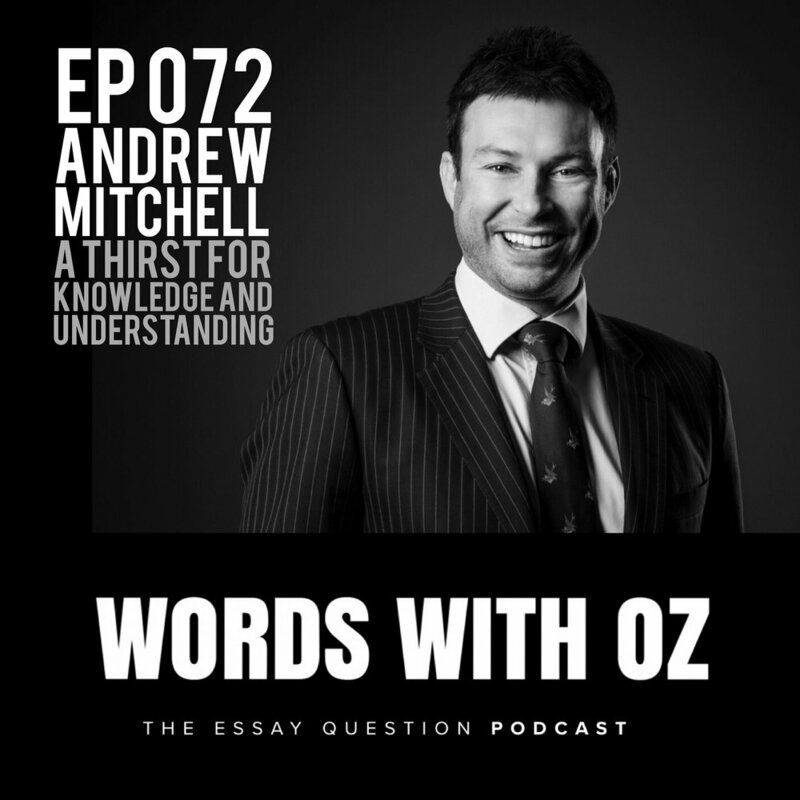 The Words With Oz Podcast is thrilled to bring to the show Mr Hamish Corlett. Hamish is an incredible father and husband, his lifestyle epitomises what it takes to remain health and active; and atop all this, he is the co-founder and partner of global investment firm TDM Growth Partners. Hamish bring his unique and driven perspective to the show. Principle based decisions filter through all aspects of his life. You will feel and hear the integrity through this conversation. We spoke on the current state of the finance industry; it’s position and responsibility in society. Hamish elaborates on his wise perspective on competition, how TDM remains patient yet acts with urgency and the fact that more hours does not equate to better decisions. Surprising stories and Welcome Wisdom. 1.13.05 : 1.14.00 – Thank You and Wrap Up.